Are you a cashier or store employee? The Live Lingua online school's English course for cashiers and store workers online via Skype is designed with the special needs of the cashiers and store workers in mind. This course is suitable for Intermediate English students and above who want to bring their English to the next level. The Live Lingua online English school's English course for cashiers and store workers online via Skype is designed with the special needs of the cashiers and store workers in mind. This course is suitable for Intermediate English students and above who want to bring their English to the next level. During this English course, Skype students will be provided with materials and activities, to enable them to understand and use vocabulary for cashiers. Students will build on their present knowledge and improve their speaking and vocabulary skills, in general and specific areas guided by native speakers who are experts on the subject. This course involves intensive training in communication skills, such as, listening, speaking, discussing and explaining. Through the use of role play, as well as group and individual activities, students will increase their skills and and vocabulary in every aspect of this process. 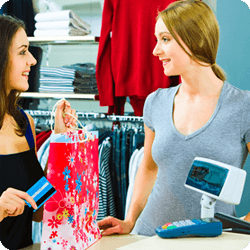 The Live Lingua cashier and store worker English course takes 4 hours to complete, broken down into 4 lessons that last 1 hour each. The lessons are via Skype, so you can take them from the comfort of your own home or office at the time of your choosing. Each lesson covers the following topics. Do you have any questions about our English course for cashiers and store employees via Skype? You can speak to one of our trained English tutors for free to ask any question you may have. They will speak with you about the details and answer any questions you may have. Speak To A English for Cashiers Tutor Today! Speak To A Tutor! What makes Live Lingua English for Cashiers & Store Employees course different from the in person tutors or enrolling at a local language school? And best of all, we let you meet and speak to your future English for Cashiers & Store Employees teacher before having to commit to paid classes! The costs for the English for Cashiers & Store Employees course below includes everything. There are no additional costs for material or registration. Still not sure if Live Lingua English for Cashiers & Store Employees tutoring is the right choice for you? Then just try a free lesson with one of our tutors to make sure. No risk, no commitment. Take a 60 minute trial Skype English for Cashiers & Store Employees lesson with one of our Skype English teachers. No credit card required.